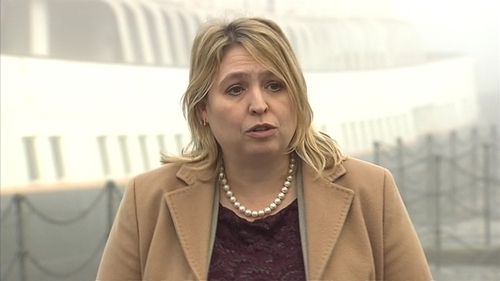 Northern Ireland Secretary Karen Bradley has said she personally backs abortion reform but the Northern Assembly must be restored to consider the issue to avoid disenfranchising 1.8 million people in the UK. She confirmed that if abortion came before the House of Commons in London, a free vote would take place, as it is a "matter of conscience". But Ms Bradley insisted her focus is on restoring the devolved assembly at Stormont, amid intense cross-party calls to liberalise Northern Ireland's abortion laws following the landslide pro-choice referendum victory in the Republic last month. Labour MP Stella Creasy, who pushed for the emergency Commons debate, said the proposal to repeal sections of the Offences Against the Person Act 1861 - which criminalise abortion - would respect devolution and not change the abortion time limit or the role of medics. She argued that she was not proposing any particular law but repealing existing UK legislation that would require Northern Ireland to act. Ms Creasy urged ministers to commit to allowing the House of Commons to express its opinion on the issue within the next 150 days. Earlier, British Labour Party leader Jeremy Corbyn hit out at the DUP after it insisted Westminster should not meddle with Northern Ireland's strict abortion regime, insisting the UK parliament has a responsibility to respect human rights standards. Mr Corbyn said: "I would say very politely to Arlene Foster: you were elected to the Northern Ireland Assembly, maybe you should play your part in ensuring that Assembly functions and we get a devolved administration working in Northern Ireland. Sinn Féin vice president and the party's leader in the North Michelle O'Neill welcomed the Westminster debate, describing it as a "first step" on the road to abortion reform in Northern Ireland. She said she wanted repeal of the relevant sections of the 1861 Act to ensure abortion was no longer treated as a criminal offence in Northern Ireland. She called for the UK and Irish governments to then come together under the British Irish Intergovernmental Conference to discuss how to change the laws on terminations in Northern Ireland. However, the party is due to consider whether to change to support unrestricted abortion up to 12 weeks at its ard fheis later this month. Speaking in the House of Commons for the UK Government, Ms Bradley said she personally wanted to see reform, but said it was "a matter for the people of Northern Ireland". She added: "Or, as (Tory MP Maria Miller) suggested, we are in danger of disenfranchising 1.8m citizens of the United Kingdom." Ms Bradley said: "The Prime Minister has been clear in her support for women's rights in respect of access to safe abortions and she welcomed the referendum result in Ireland. DUP chief whip Jeffrey Donaldson said 100,000 people are alive in Northern Ireland today because the Abortion Act 1967 was not accepted. The MP said the law in Northern Ireland had been shown to reduce the number of abortions in the jurisdiction, and said: "For that reason I am very thoughtful about any change in the law in Northern Ireland." He added: "There are strong voices on both sides of this debate, this is a devolved issue - it should be left to the people of Northern Ireland to decide."